Le Livre D’Image announced as being in competition at Cannes. Also Pierrot Le Fou featured on the official 2018 poster. Where can I get one of those? It's rather much like the credits sequences at the end of his films. We have some audio from the ending of Contempt (with JLG as the A.D. saying "Moteur") and then afterwards some of Hans Otte's work last used by JLG in Notre musique (from Otte's The Book of Sounds). The glimpses of image that we do get are incredible, the texture and color and movement of it. I hope this is every bit as psychedelic as Adieu au langage aside from remaining in 2D. Another bit I spotted - in the flashing title text at the end, a few frames of on-screen text from Ici et ailleurs referencing the Arabian Nights: "Peut-être que dans mille et un jours, Shéhérazade racontera tout cela différement." / "Perhaps in a thousand and one nights, Scheherazade would recount all of this differently." We also see what appears to be a credit for Michael Bay's 13 Hours, and my favorite French rendering of an English title ever, Les Dents de la mer aka Jaws. The names are of extreme interest - Godard / Battagia (Jean-Pierre, Godard's assistant) / Aragno (Fabrice, Godard's DP/collaborator) / Brenez (Nicole, perhaps our finest living writer on film). Her writing in recent years has sought to unearth all manner of unknown cinema, so it's fitting that she's credited (according to the French wiki article on the film) with 'Archéologie.' With a particular interest in experimental and politically radical filmmaking, you can see some of that influence in other names spotted in the trailer, like Hollis Frampton or La Commune (Peter Watkins, maybe, but also perhaps a 1914 film by the filmmaker & anarchist Armand Guerra). And what a fantastic interview it is - although, on a more melancholic note, the transcript (and JLG's own words) make it clear that Godard is struggling more with his recall of words and memories these days. That having been said, he's still extremely lucid overall. I found the link between Godard, Marina Vlady, and her late husband, Vladimir Vysotsky, particularly interesting (one of Vysotsky's songs appears in Le livre d'image). Vysotsky's own story, particularly the events surrounding and leading up to his death, are pretty harrowing to read about. 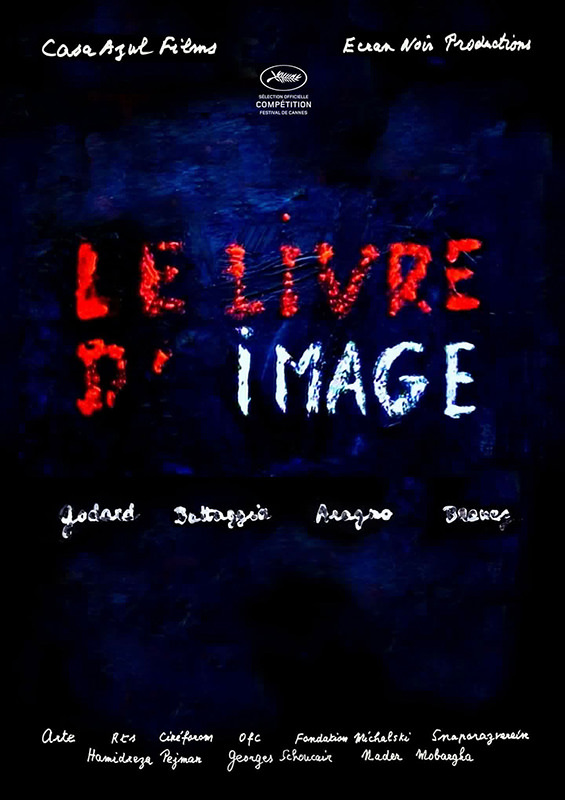 It's also interesting to note that it seems like, as far as Godard and Aragno are concerned, the only officially sanctioned way of experiencing Le livre d'image is via one of the four announced installations to come hopefully later this year. While they have sold the rights elsewhere, in the U.S. for instance, they seem rather dismissive of the idea of watching it in a regular cinema setting. I'm quite thankful, of course, that we will be getting a more traditional release (particularly one that should lead to a home video edition). Meanwhile Livre d‘Image had its Swiss premiere in a Theatre in Lausanne, pretty close to where Godard lives*. There is some kind of image installation alongside the premiere plus a Godard curated (?) small programme incl. The Moments Choisis and some other recent films of him. There is an entry for this on the Theatre website and with the Swiss Cinematheque. I am on my phone and can‘t check the links but google may help. This might be something that Fabrice Aragno mentioned in Cannes, that the film will travel with parallel art installations. The two links missing from my yesterdays post, for those interested. In other JLG news, Mubi is advertising that Le livre d'image will make its debut on their UK service on December 3 (and will, in the absence of proper distribution anywhere else outside festivals and gallery installations, doubtless soon-after be everywhere online). This follows the day after a single night of screenings in various UK cinemas. That subtitling ratio seems about the same as the DCP (and, yes, quite arbitrary what gets subbed and what doesn’t). Plenty of lame puns go flying by, but also a fair bit of what presumably counts as substance for this film. The most formally interesting thing about the film, which is presumably missing on Mubi, is the play with multichannel sound, Godard radically splitting the soundtrack front and back and down the middle. But it’s nothing that hadn’t been done more successfully and adventurously by more accomplished experimental filmmakers decades ago. I found this rather intoxicating, but I haven't seen any of Godard's post 60s work so that might be a factor. But I for sure need to watch this again. I think that's probably the only condition by which praise could be expected! Imagine if you'd seen those same clips, edited in the same fashion and with the same tricks of text and presentation, multiple times in multiple other Godard films, only those other times there was logical coherence and purpose in their usage. It's kinda like praising the Rolling Stones as a great rock band on the strength of "Anybody Seen My Baby"
I guess so. I'm waiting for my winter break to finally go through his films chronologically, so hopefully I'll get to Histories(s) soon. Wow, domino really hates this, huh? I can't wait to see it myself, because, um, Sight And Sound said that Godard’s multifaceted essay film revels in the mobility and mutability of imagery in the 21st century, uncovering the violence of representation but always searching for hope in a cacaphonous world!! I must say, I didn’t see much that was 21st century about this film. Godard has been banging this particular garbage can lid since the 1980s. Maybe you can not see much because you are stuck in your own wormhole century? I know and understand "critics" (probably in between 50-65 years old which translates into a certain generation of cinephilia) that are fed up with Godard, mostly due to the "powerfull and influential" generation that came before them (active in the 60s - then academics, et cetera). But such snarky comments like yours (carbage can lid since the 80s) is really not doing any service. Thankfully a newer generation, especially people that are actually doing creative things, can see Godards work in their own light (i do not count myself to the newer generation). My reply was regarding his actual last post (i.e. the garbage bin thing), and not about his tastes in cinema, as adventourus as they might be. But Godards comments are usually funnier and (more importantly) more interesting than just thrashing someone down. As Peter Kubelka onces said (i think zeds once wrote something nice about him around here, so maybe he can live with this): Godards quotes and comments are a lot more interesting than his films. It is not the single Godard film that is that interesting (anymore), but his palette, both in form and content, and remixing them over and over again. Its a work in progress, and not the cinematic Masterpiece in a traditional sense. (zeds all knows this, and probably better. I am just adding this as a personal response). He didn't say anything about a "garbage bin" though. He was talking about banging on a garbage lid, ie. making a big racket. It's a similar idiom to 'banging on a pot'. I think you focused too much on the word 'garbage' and missed zedz' meaning. Absolutely correct, sorry zeds and the others!